Alliance Francaise will celebrate the Music during 4 days! 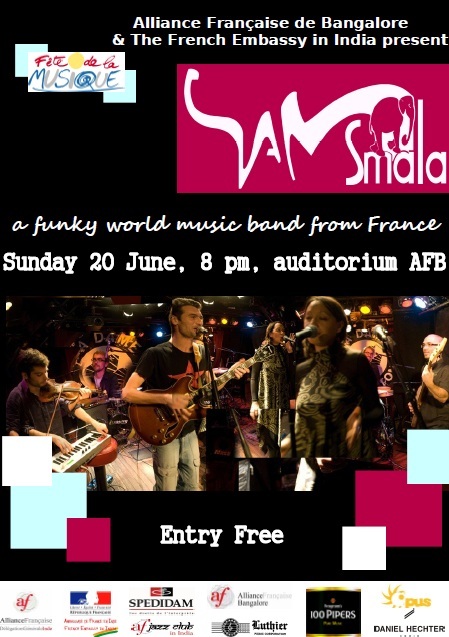 Come to share this fabulous event and discover French and Indian bands! Rolling Stones, Eagles and many others. Lounge Piranha is always evolving into new spaces and sounds. as one of ‘India’s Hottest Bands’. sounds and genres of music covering a wide range of styles. western styles, supplementing it with ear training and vocal training. out of the learning process at the school itself. music and plans to produce it soon. and the singer of “Carhabana”- an amazing fusion of Cuban jazz and Manouche jazz. jazz, soul, hip-hop, fusion, funk and rock.